This WHMIS 2015 Train the Trainer package equips you with all the tools you need in order to train and certify your colleagues, staff or clients in the newly updated Workplace Hazardous Materials Information System (WHMIS 2015). Once your course is completed, your training resources will be available for download. The student presentation includes off-screen slide-by-slide instructor notes and activities to help keep learners engaged. This presentation format has been designed to work best with WHMIS Participant Guides. 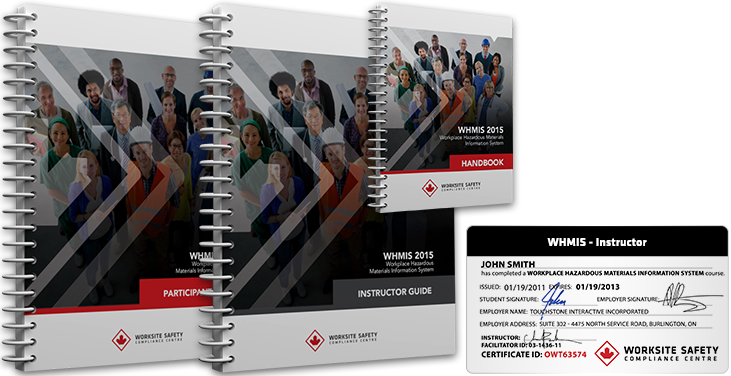 In addition to your digital assets, you will also receive a physical copy of your Instructor certificates, a WHMIS Instructor Guide, 10 WHMIS Participant Guides, and a WHMIS Handbook. Shipping is included in the purchase price. The “Participant Guide” enables students to follow along with the latest edition of the classroom presentation. It is a low-cost, light weight, and highly interactive teaching aid. The guide is filled with exercises that have been developed to aid retention and serves as a useful reference tool. Each guide contains an exam as well as a serialized certification card. Certified trainers are required to provide one Participant Guide per participant, per class. Additional guides can be purchased here. Paul B. Well worth taking the training through Worksite Safety and the instructor made it more enjoyable. Lesley C. Love the convenience of updating employee training online without compromising the quality and thoroughness of the training. Chris A. It gives us flexibility while allowing our users to receive well researched, descriptive, yet concise information at a competitive price. Thank you! Joseph M. Great resource, and user friendly. Jelle T. Staff was very helpful and got me a certificate as requested. They were good at getting back to me in a timely manner and were very nice. William G. Steve did an excellent job with teaching the course, made it fun and made sure everyone understood why it is important to be safe working at heights. David B. Very informative. The instructor was well informed and made the course enjoyable. I would recommend it. Lucas K. Excellent on-line training and easy to navigate content. Very convenient certification for busy people. Steve B. Ordered the books and received them 2 days later. Awesome service. Roy K. Easy to use and user friendly even for not so Techy people. Elaine O. Good course very helpful staff. Steven R. Very concise information for each programme. Easy to navigate online platform. Thanks. Robert G. Very happy with this site! Printed my certificates no problems. Got me a job within 3 days! Highly recommend! Troy W. I was very satisfied with the level of quality and information covered in your e-course. I will recommend to others. Nick D. The training was extremely interesting and useful. Thank you. Harry K. Very helpful staff with questions that I needed answered. Easy to access in order to complete courses. Nicole P. The service was amazing, fast and very helpful! Thank you for making what seemed like a timely and complicated process so very easy!!! Learn about the fundamental principles and strategies that will build your confidence and help you deliver training effectively, every time you step into a classroom. Learn how to prepare for delivering your course with the aid of a training plan while accounting for the learning environment and any introductory messages that need to be delivered. Icebreakers covers introductions for adult learners. This includes introductions to the instructor, the purpose of the course, addressing expectations, and brief activities to engage adult learners. Learn about the unique characteristics of training adult learners, strategies for teaching adults, the DISC Model, and behavioral styles. In most training sessions there are challenges when it comes to making sure all learners are engaged. Learn about useful strategies for asking questions, handling group activities, and requesting feedback. Being able to handle challenging learners can ensure a pleasant and productive training experience for all involved. Learn about how to become an effective communicator, overcome barriers, and manage unique challenges. Learn all about the legislative changes to the Workplace Hazardous Materials Information System with the introduction of WHMIS 2015 and the GHS system as a replacement to WHMIS 1988. Learning objectives include inspection & enforcement, your rights and responsibilities as a worker, employer responsibilities, and supplier responsibilities. Learn about the different WHMIS hazard groups and how to understand the severity of risk associated with each sub-grouping, category, sub-category, and class. You will also learn about WHMIS exemptions. Learn how to identify hazards through the pictograms used in labeling and safety data sheets. This includes situations where more than one class or pictogram may be used. Learn all about the components of supplier labels, reading hazard statements, older labels from the WHMIS 1988 system, workplace labels, other forms of identification, and your worker responsibilities when it comes to labels. This chapter covers the use of Safety Data Sheets (SDS). This includes the reasoning for why safety data sheets are used, where to find them, different formats you may encounter, different sections of an SDS, confidential business information on an SDS, outdated MSDS from WHMIS 1988, and hazard controls. Learn how to protect yourself on the job through controlling hazards, PPE and entry points, selection of appropriate PPE, and how to identify which PPE may be required as per the Safety Data Sheet. React in a timely and efficient manner in the case of an emergency by learning how different labels and SDSs outline procedures for situations involving first aid, spills, leaks, fires, or explosions. Learn where to find additional information in the case of an emergency and what additional training you may require from your employer to react appropriately to an incident. Some organizations require multiple trainers. Depending on how many instructor training packages you purchase, you may receive a discount. Once purchased, training credits may be used to assign training to users in your account or held for future use. In addition to the training that you purchase, you will also have access to a number of free training management tools. 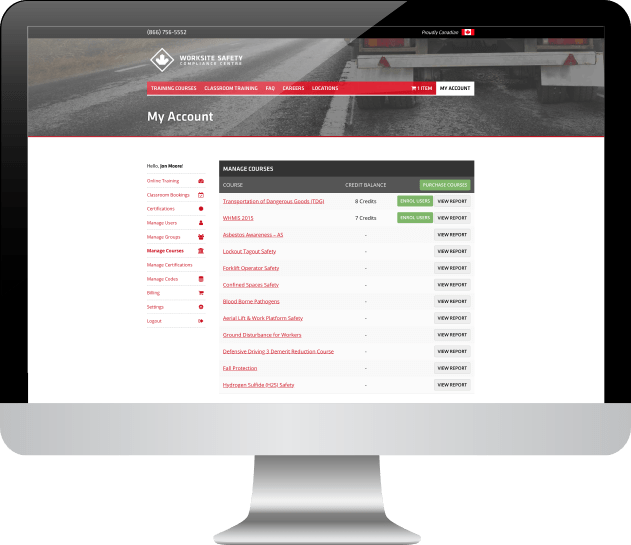 These tools allow you to add and manage users in your account, distribute training courses, view training progress, print certificates, view records of training, and create customized certification reports to ensure your users are always in compliance. We put our team of professionals to work to build solutions that improve results, save time, relieve your budget and keep your people safe. 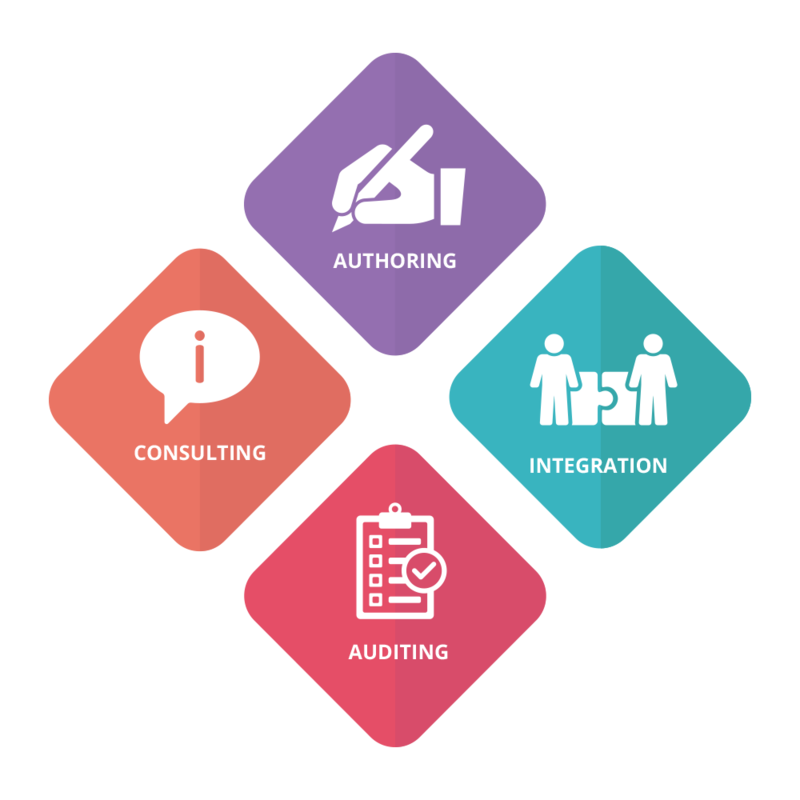 In addition to our training programs, we also provide Consulting Services, Train The Trainer Solutions, Course Authoring, and Integration services. It is our mandate to develop plans and programs that meet the unique needs and environments where staff carry out their work on a daily basis, creating customized programs that deal with risks specifically for each situation. Our consulting services include OHS Auditing, Safety Policy Development, Procedure Writing, Training Needs Analysis, Safety Inspections, Job Safety & Hazard Analysis, Emergency Response Planning, and Fall Prevention & Detection. Customize and control the learning experience of your staff or customers with our Train the Trainer offerings and enjoy the peace of mind that comes with our lifetime complimentary update service. These packages educate new trainers on how to deliver in-person training to adult learners. Packages include Instructor Certification courses, expanded reference manuals, ready to customize classroom presentations, exam templates, certificates, and participant guides for students. Deliver original content courses to your staff to address the unique hazards associated with your workplace. Our team of industry leading instructional designers and subject matter experts are able to develop defensible, effective, and efficient training programs that you can deliver as elearning content, self-learning course books, reference materials for classroom teaching, or as an app that integrates with existing frameworks. Training programs can be something that is built from scratch, or modified using pre-existing course materials from our library or your own.